I am going to WordCamp Philippines. Are you? I’m going to the first WordCamp in the Philippines! Need we say more? If you haven’t heard, WordCamp Philippines will be on September 6, 2008, Saturday at College of Saint Benilde, Taft Ave., Manila. WordCamp is the premier event for WordPress users and developers. 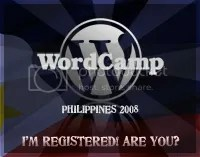 If you have done so register at http://philippines.wordcamp.org to make sure you get your camper’s badge!